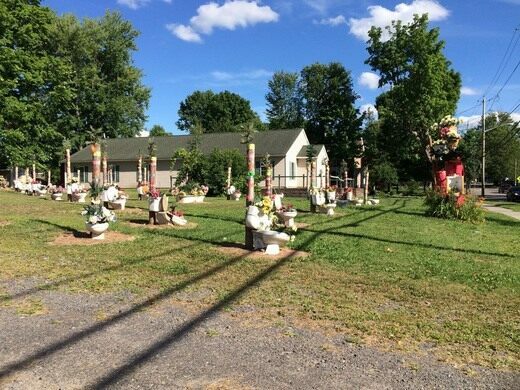 Potty Garden at 28 Pierrepont Ave.
Potty Garden at 85 Maple St.
What started as a protest against village zoning rules over ten years ago has sprouted multiple Potty Gardens in Potsdam, New York. Final resting place of Typhoid Mary. 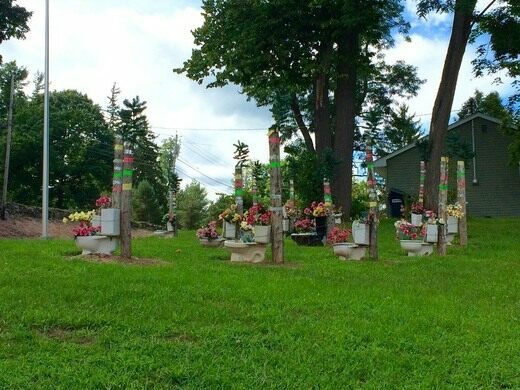 Land owner Hank Robar installed rows of toilets and urinals filled with brightly colored flowers on his village lot, some also secured to vibrantly striped posts for added security. Local anecdote says that the protest began when Robar attempted to sell his property to a donut shop franchise and was denied by the zoning board; even though the other three corners of the intersection are commercial, his property at 82 Market Street is residential only. He’s kept up the protest ever since. A second garden has popped up at 85 Maple Street—directly across the street from Clarkson University—on a rental property also owned by Robar. A third garden was once installed on Pierrepont Ave, at another of Robar’s properties. 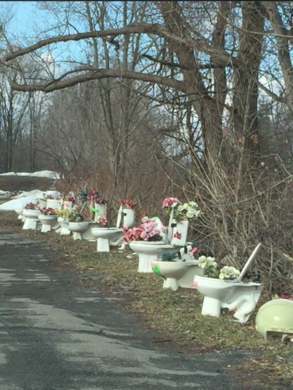 An arson-damaged apartment at the site was ordered to be torn down by the village, and Robar erected another toilet installment on the empty lot to show displeasure at having to pay for the demolition. The property has since sold, and the toilets taken down and moved to a driveway at the intersection of Pine Street & Sandstone Drive, which leads to the Maple Street garden. 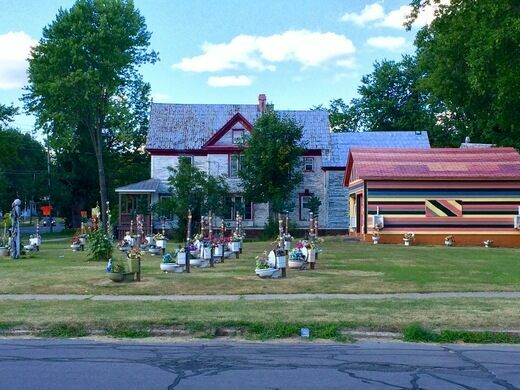 The two current Potty Gardens are found at 82 Market Street and 85 Maple Street in Potsdam, New York. Dozens of houses in the Adirondack Mountains are reminders of a literal "cottage industry" to cure people of a deadly disease.